Learning to recognize sight words makes reading more complex words easier for students. With daily practice throughout the school year, students can learnmore than 100 high-frequency words and have fun at the same time. 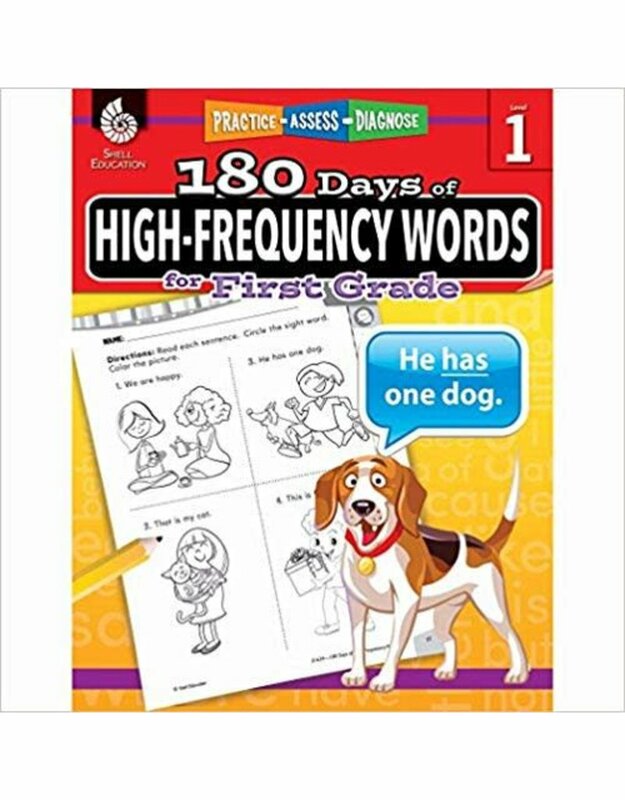 This workbook, modeled after Fry’s 1000 Instant Words, allows teachers to easily incorporate daily sight word recognition into language arts lessons. With emphasis placed on target words instead of the activities, the repetitive structureengages students to familiarize them with the target words. Each week, five new sight words are introduced throughhands-on activities, collaborative work, writing practice, and more. With varied and fun exercises, students can improve reading comprehension and fluency. The teacher-friendly workbook series provides a weekly outline of activities for each set of target words, as well as downloadable files for easy lesson planning and material prep, and weekly or cumulative assessment. Aligned with state standards, 180 Days of High-Frequency Words helps boost reading, writing, and spelling skills of First graders to inspire confidence and success.